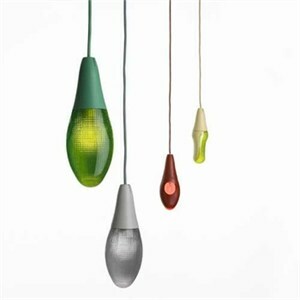 The light for your home garden, the terrace, spaces around the swimming pool or for the vegetable garden. Pod Lens is high, low, stuck into the ground, in bunches or festoons on the branches of trees. The diffuser, reminiscent of natural forms like those of flower buds, is made entirely of polycarbonate, with over-moulded walls that make the lamp waterproof and its colours resistant to ultraviolet rays. Inside the house, when raised on a high stem with aluminium base, it becomes a lightweight floor lamp. Choose how you would like to mount it from pendant mount (fixture does not include junction box mount, but can be "draped" from branches etc. ), wall mount, as a ground stake or a floor lamp (floor mount requires stem and base- mobile or stationary). All are wired with an 8' grey weather proof cord and plug set.